The solubility of this compound in DMSO is >26.5mg/mL. General tips for obtaining a higher concentration: Please warm the tube at 37℃ for 10 minutes and/or shake it in the ultrasonic bath for a while. Stock solution can be stored below -20℃ for several months. 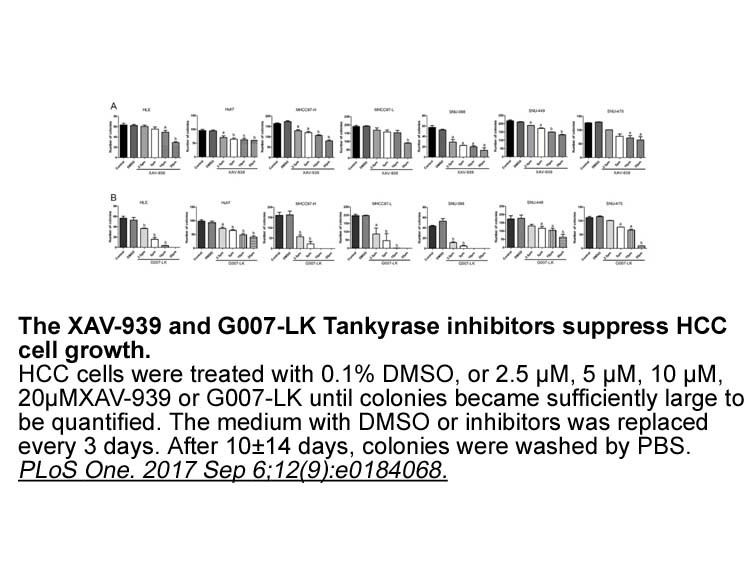 G007-LK inhibits cell-cycle progression, reduces colony formation, and induces differentiation, suggesting that b-catenin–dependent maintenance of an undifferentiated state may be blocked by tankyrase inhibition. G007-LK showed antitumor efficacy for Xenograft COLO-320DM tumors mice. TNKS1 and TNKS2 protein levels were reduced, AXIN1 and AXIN2 were stabilized, and b-catenin level was decreased. Lau T, Chan E, Callow M, Waaler J, et. al. A novel tankyrase small-molecule inhibitor suppresses APC mutation-driven colorectal tumor growth. Cancer Res. 2013 May 15;73(10):3132-44. G007-LK is a potent and specific inhibitor of tankyrase 1/2 with IC50 values of 46 and 25 nM . The telomeric repeat factor 1 (TRF1)-interacting ankyrin-related ADP-ribose polymerase 1 (tankyrase 1,TNKS1) and tankyrase 2 (TNKS2) belong to the subgroup of poly(ADP-ribosyl)ating polymerases and regulate the assembly and disassembly of large polymerized structures . G007-LK is a potent and specific tankyrase 1/2 inhibitor. G007-LK reduced auto-poly-(ADP ribosy)lation of TNKS1 and TNKS2 with IC50 values of 46 nM and 25 nM, respectively. In Wnt3a-induced HEK 293 cells, G007-LK inhibited ST-Luc with IC50 value of 0.05 μM . In SW480 colorectal cancer cell line transfected with GFP-TNKS1, G007-LK induces highly dynamic and mobile degradasomes containing phosphorylated beta-catenin, beta-TrCP and ubiquitin . In the APC-mutant cell lines, G007-LK reduces cytosolic and nuclear β-catenin protein levels . In mice bearing COLO-320DM cell xenografts, G007-LK (20 mg/kg twice daily or 40 mg/kg daily) concentration-dependently inhibited tumor growth by 61% and 48%, respectively. Also, G007-LK reduced the levels of TNKS1/2 and β-catenin, and stabilized AXIN1/2 .
. Voronkov A, Holsworth DD, Waaler J, et al. 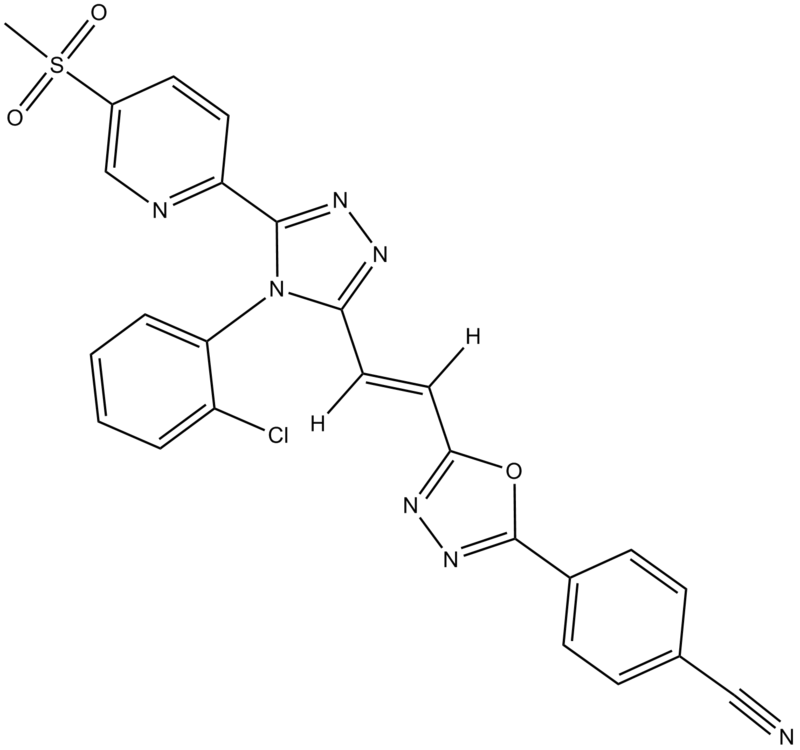 Structural basis and SAR for G007-LK, a lead stage 1,2,4-triazole based specific tankyrase 1/2 inhibitor. J Med Chem, 2013, 56(7): 3012-3023.
. Thorvaldsen TE, Pedersen NM, Wenzel EM, et al. Structure, Dynamics and Functionality of Tankyrase Inhibitor-induced Degradasomes. Mol Cancer Res, 2015, pii: molcanres.0125.2015.
. Lau T, Chan E, Callow M, et al. A novel tankyrase small-molecule inhibitor suppresses APC mutation-driven colorectal tumor growth. Cancer Res, 2013, 73(10): 3132-3144.